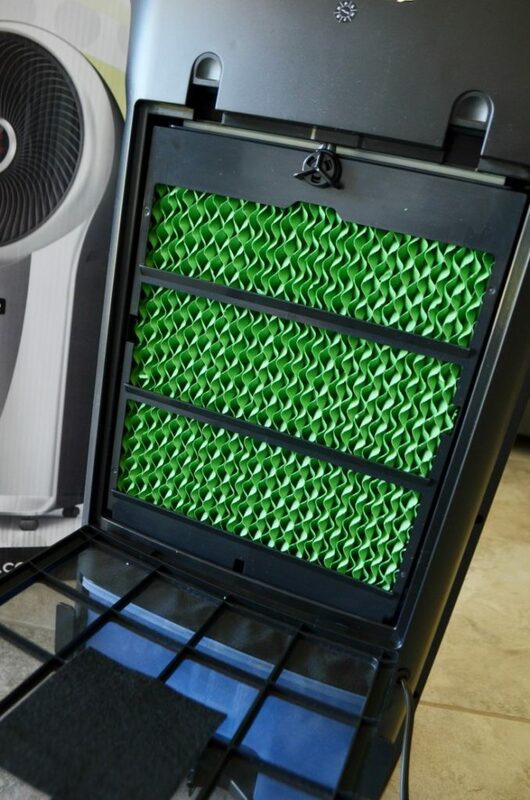 Thanks to NewAir for sending along 2 cooling units for us to test out and compare for indoors and out! We’re now ready for a summer of fun entertaining outdoors and enjoying a cool good night sleep indoors. We love entertaining outdoors in the summer, but living in one of the hottest and driest states it’s nearly impossible. These 2 systems make keeping cool in the summer simple and might even save you a little on those high summer electric bills! Have you ever been to a restaurant with a misting system and think how nice that would be for home entertaining. The NewAir AF-600 Misting Fan is a cost effective, portable system, and answer to your cool summer dreams. It has the power to cool your outdoor spaces up to 15 degrees. When you’re looking to an endless summer of 110-115 degree days and no end in site 15 degrees is the difference between fresh air and days cooped up indoors. The Northwest has snow days, the Southwest has heat advisories. We long for the cooler autumn days and a misting fan can help you stay cool outside this summer. 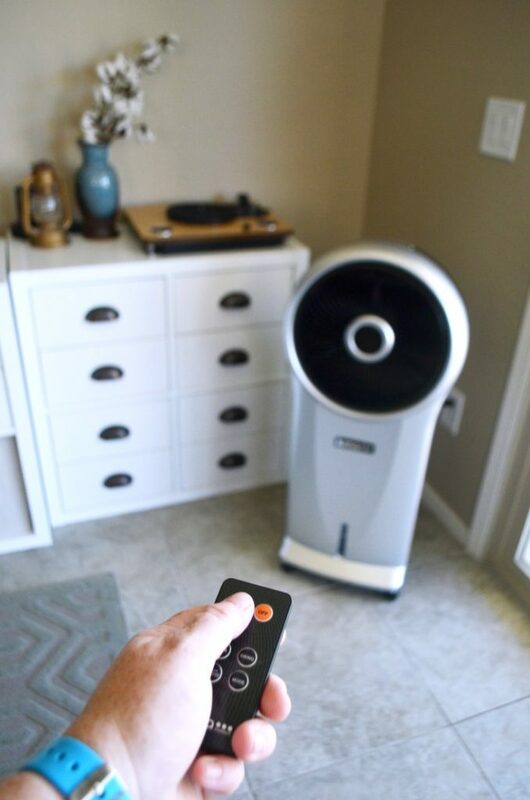 Adjustable fan head tilts and oscillates to aim cool air where you need it. Lightweight for portability and easy storage. Water hook up is easy with a standard hose connection and on/off control valve. Control your comfort with three fan speeds. Multifunction as a dry or misting fan. Perfect for cooling off during hot days and warm evenings. Assembly involved only 3 steps and the use of a phillips head screwdriver and wrench. Simply attach the base with the provided nuts, bolts, and washers. Place the decorative cover over the pole onto the base, then slide the fan assembly onto the telescopic pole. 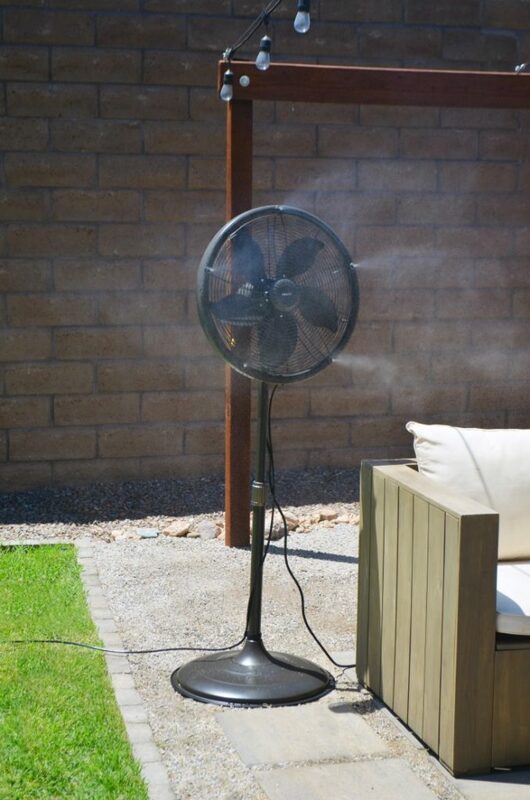 To setup the misting fan for use you’ll need an extension cord and hose. 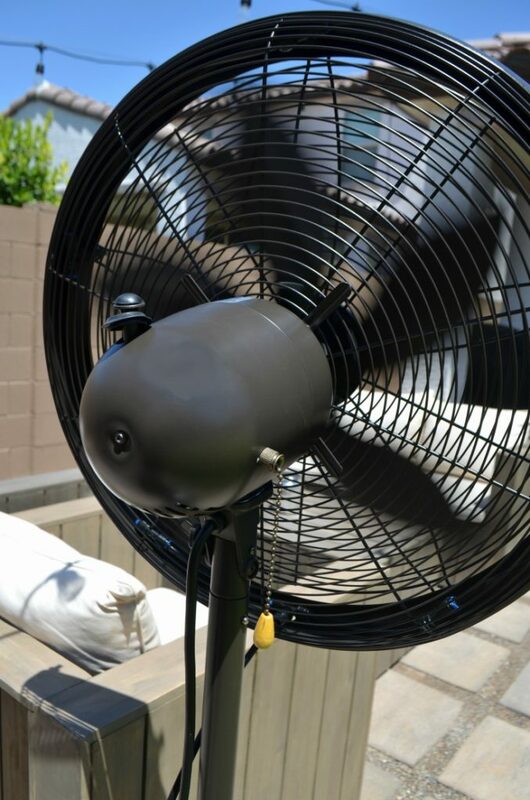 Simply plug in the fan, then attach the hose to the fans water line. Easy to setup, move, and take down. The weighted base means it’ll stay where you put it without fear of kids or the wind knocking it over. 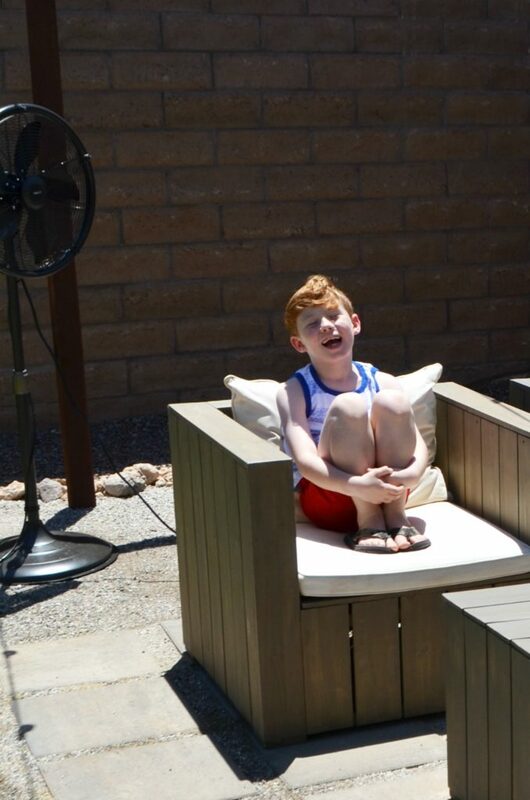 Evaporative coolers are the ideal companion for those living in hot arid places like my home state of Arizona. They work on the system of cooling through evaporation. 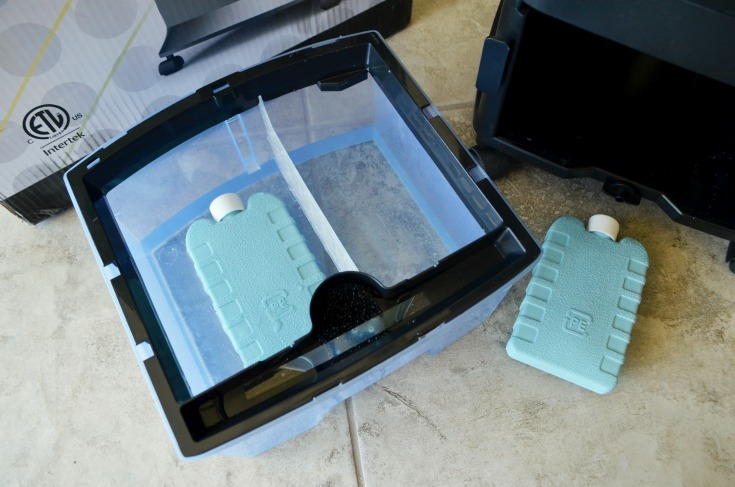 Water is soaked up through a cooling pad, the fan blows dry air across the pad resulting in rapid evaporation to create cold air that’s then blown into the room. Evaporative cooling can lower temperatures 20 to 30 degrees. Having a portable lightweight system allows you to move your cooling needs from space to space. Do you have a room in your home that tends to be warmer? Do you find yourself lowering the temperature to cool other parts of your home? Do you do work frequently in the garage? 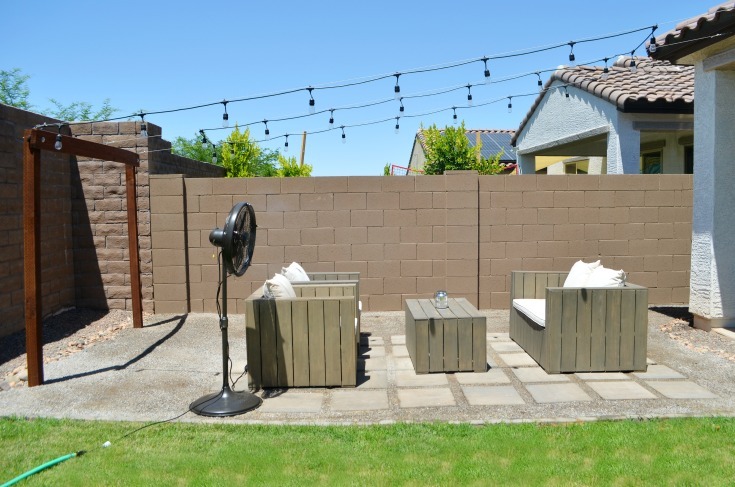 Entertain on your patio on hot/dry summer days? Yes, yes, and yes! 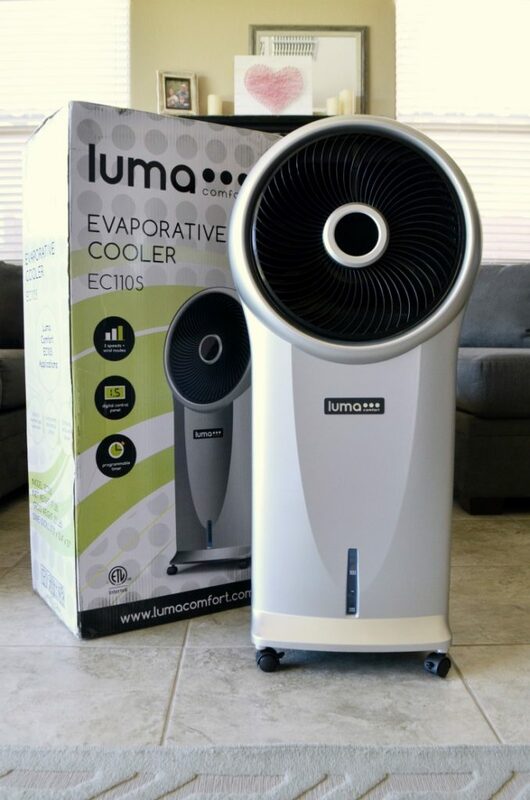 So far these are all the uses we’ve found for the Luma Comfort EC110S Evaporative Cooler. Mainly to keep our sons’ room at a comfortable temperature for sleeping without freezing out the rest of the home. It uses much less electricity than our AC, which means we’re able to have a comfortable home AND conserve energy. Remote with programmable timer adds convenience and ability to adjust settings from a distance. Efficient model provides energy savings of up to 75 percent over portable air conditioners by employing water evaporations natural cooling powers. 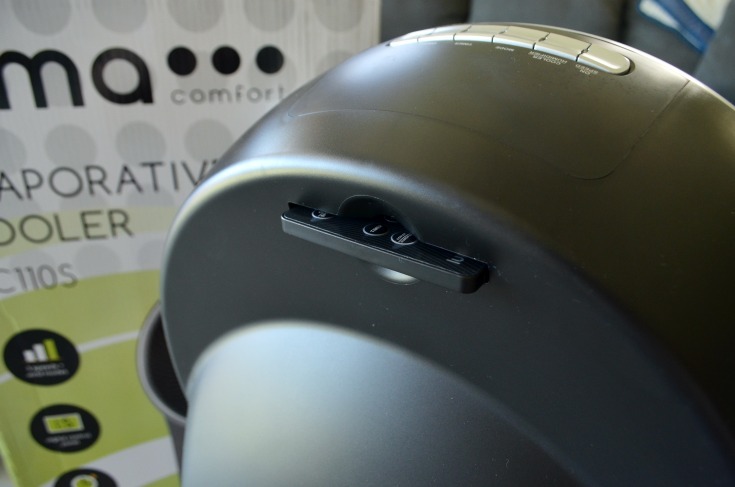 Simple touch controls add to ease of use, and allow you to control the air flow. Swing mode (kind of like oscillating) distributes the air more evenly. Wheels and a lightweight design simplify your cooling needs. Engage the sleep setting for a quieter operation. Dual function modes for flexibility. Switch between evaporative cooling and standard fan mode. That means on humid days you can still enjoy the cool air without adding more moisture to the air. The unit was ready to use right out of the box, just add water. If you want an extra little cold boost, 2 freezer packs are included which do require freezing ahead of time. 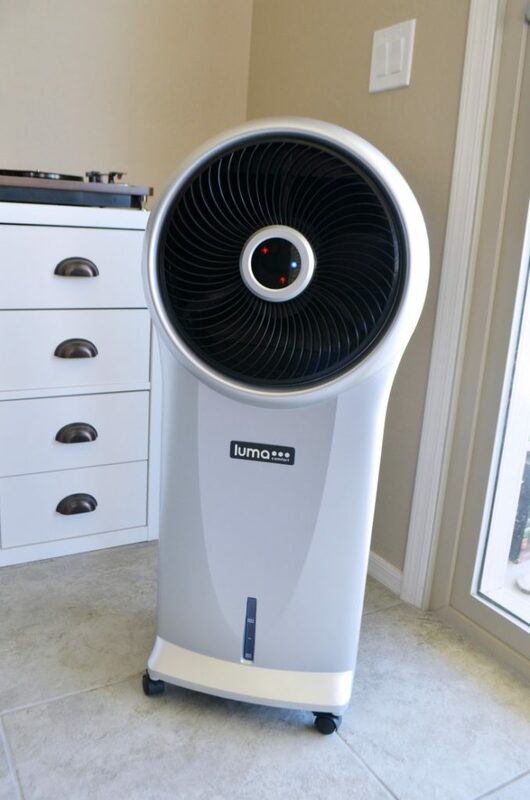 Other than that just fill, plug-in, and start enjoying the cooling power of the Luma Comfort EC110S Evaporative Cooler. Both systems work on the system of cooling air through evaporation. 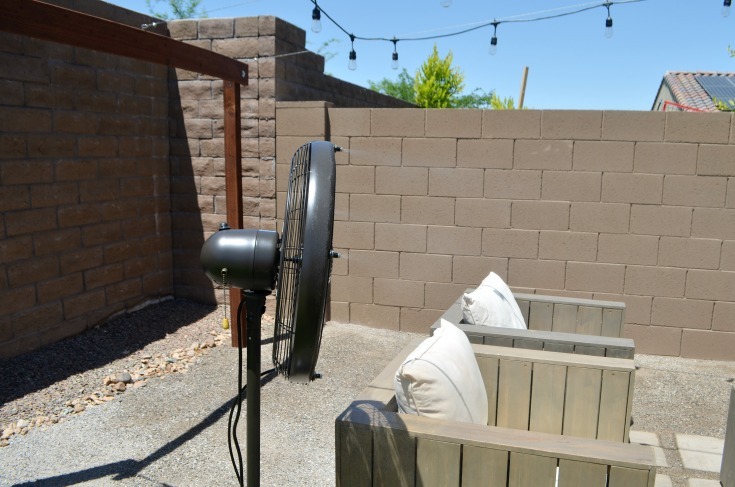 Misting fans are best used outdoors due to their wet nature while evaporative coolers can be employed almost anywhere: indoors, a garage, or an enclosed patio. The featured misting fan has a larger cooling area up to 600 sq. ft of space, while the evaporative cooler cools up to 250 sq. ft.
There’s no comparing apples to apples here as each has it’s best function and space, which is why we opted for both types of units. 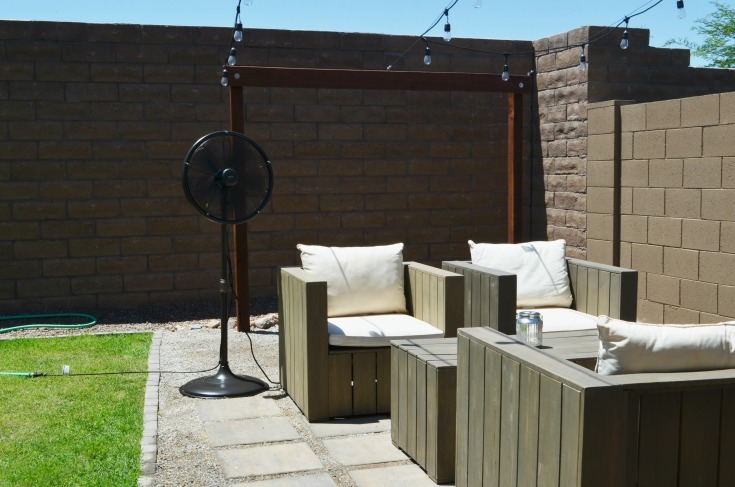 The misting fan will live in our outdoor living and entertainment space, while the evaporative cooler will roam where needed. From our partially enclosed patio to our garage. It’s the perfect weekend warrior companion, allowing us to power through projects in the stifling garage workspace. Stay hydrated. Load up insulated water bottles with ice and water to keep cool in the car or while outdoors. Even if you’re just running errands around town you can get dehydrated. Keeping water on hand will increase your intake. Opt for a straw instead of a screw or pop top lid. You’ll find yourself reaching for the glass more often. Replace carbonated drinks with flavor infused water. 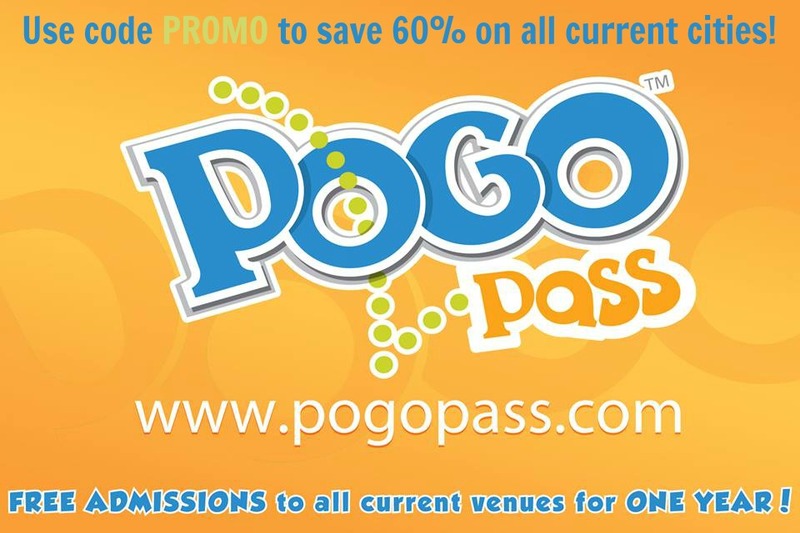 Take the cooling effect of a misting fan or evaporative cooler on the go. Freeze a damp bandana and tie around your neck if you’ll be outdoors. This was one trick we employed during sweltering summers in marching band. This looks like a great product for a garage too!